I love it when someone asks me what my weekend plans are and I can say, "I have no plans. It should be a quiet weekend." Don't get me wrong, I love being busy, too, but sometimes it's nice to have a weekend when I can just be home to run errands or "piddle" around the house at my leisure. My favorite "no plans" weekend includes a Saturday morning when I can get up and go to the Farmer's Market to pick up fresh produce, farm fresh eggs, locally raised beef, and fresh cut flowers. 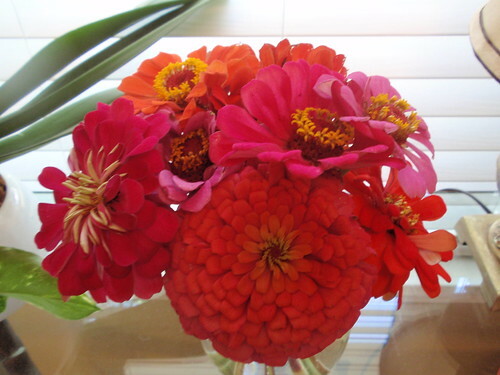 I picked up this beautiful bouquet of zinnias for $1 at the Farmer's Market. What's not to love?! 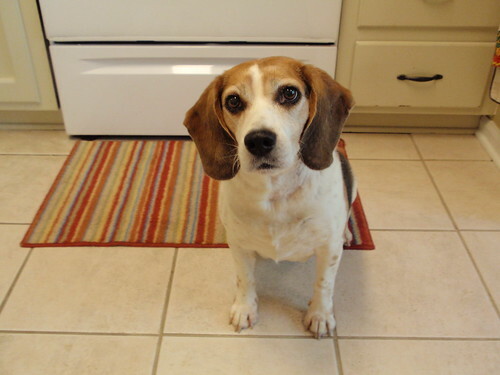 My favorite Saturday also includes plenty of time for me to be in the kitchen, listening to my ipod, cooking up a new recipe with my little buddy Chip. This weekend, I finally found an excuse to try a Mexican lasagna recipe I've had my eye on for some time. This is one of those recipes that falls under my "comfort food" category, the kind of food that makes you want to go back for seconds. Chop up tomatoes, onions, and garlic as small as you prefer. Saute in pan with a tablespoon or so of butter. Add approximately 1 tablespoons chili powder, and 1 teaspoon of paprika and 1 teaspoon of cumin. Stir until nicely combined. Add beans. Mix cooked rice together with tomato/onion/garlic mixture. Brown the ground beef using about 1 tablespoons chili powder, 1 teaspoon paprika and 1 teaspoon of cumin and salt to taste with about 4 ounces of water to create the taco beef. 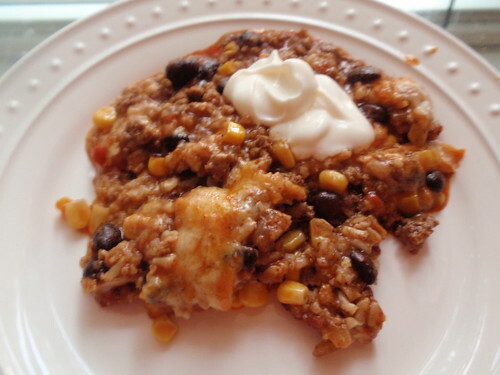 Spread half of the can of enchilada sauce in the bottom of a large casserole or baking dish. Layer on tortillas covering enchilada sauce. Some overlapping is expected. Divide your rice mixture in half and spread it over the layer of tortillas. Divide cheese in half and layer it on top of the rice layer. Add another layer of tortillas on top of your cheese layer. Pour the rest of the enchilada sauce over the tortillas and spread it out evenly. Add layer of browned ground beef. Add can of corn (drained) on top of beef layer. Then the remaining amount of rice mixture on top of corn layer. Then top with the remaining cheese. Bake at 375º for 25-35 minutes until cheese has melted and begins to brown a bit.